Isham Andrew Jackson Smith was the 7th child of Stephen Smith and Mary Newton born 28 May 1835. He married Mary "Polly" Farmer on 21 October 1857 in Copiah County, Mississippi. Isham, Polly, and their family attended Little Bahala Baptist Church where both the Farmers and the Smiths had attended the church since the 1820s. In December 1855, both Stephen Smith and Henry Farmer (father of Mary Farmer Smith) were Trustees. 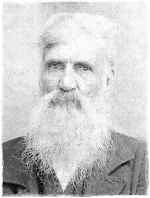 Isham Smith, who was in all probability the grandfather of Isham Andrew Jackson Smith served as a pastor for 4 years in the 1820s. (Source: History of Little Bahala Baptist Church, Celebrating 175 Years, November 14th 1993). Isham Andrew Jackson Smith served in the Confederacy as a Private, Mississippi Light Artillery, 1st Regiment Company F, Bradford's Battery. He was killed by a bolt of lightening that hit him as he sat in his home, in front of his fireplace pm 15 July 1876.